Forum Home > 7Axx General Discussion Area > Newbies first solo hunt (and kill) for 7a28 7040? Yeah looks like a bit of a 'fuzzy photo gamble' on your part, Christopher. But like you said I've seen a lot worse eBay listing photos. There's always plenty of 7A28-7040 / -7049's on eBay, in varying conditions. They were obviously a big seller in their day and still popular with collectors nowadays. Amusingly, I noticed that one of the losing bidders on the example you sniped was y***k ( private ). That's the other eBay ID (Kyiaye) which US-based profiteering re-seller WorldWide66 uses for buying. Your guess is as good as mine - it may be a decent example, but it's not particularly well listed (poor photos - not worldwide visible). Deserves to go over $300. Made $310 - bumped there by another new eBay ID with a feedback of (1). Hope your fuzzy photo gamble pays off and that the **Needs a new battery. ** doesn't turn out to be any more than just that. Hey Paul, my "fuzzy photo gamble" arrived yesterday and although all this watch stuff is new to me I think I can tell a good condition one from a bad without too much trouble, so I am delighted to say that I believe I bagged a "good un". I hope the photos are alright. The serial # on the back reads 2D0923 and its a -7049. I was so pleased when I saw the condition, too good to be true I thought, not a ding on it and the dial is perfect and the chrono functions 100%. Oops Im starting to gloat! I took it to my local watch guy to have a new battery installed (it wasn't working ) and when he opened it up there was already a battery in place. But but the wrong size; too big he said and that I was lucky the oversized battery hadn't done any damage when the case back had been replaced. Funny really because the seller told me that it needed a new battery to make it work like he had seen it work, maybe he was selling it for someone else? I also asked the watch guy if he could service it and he replied sure he could but what for ? " its running like a charm ". Anyway he put in the right size battery and a new case gasket with silicone and said "nice watch, $20 please" So here are a few photos of my newly acquired little bit minty 7A28-7049. Thanks for a great site by the way. A real pleasure to read. Nice Find, I bet you now have the 7Axx Bug! 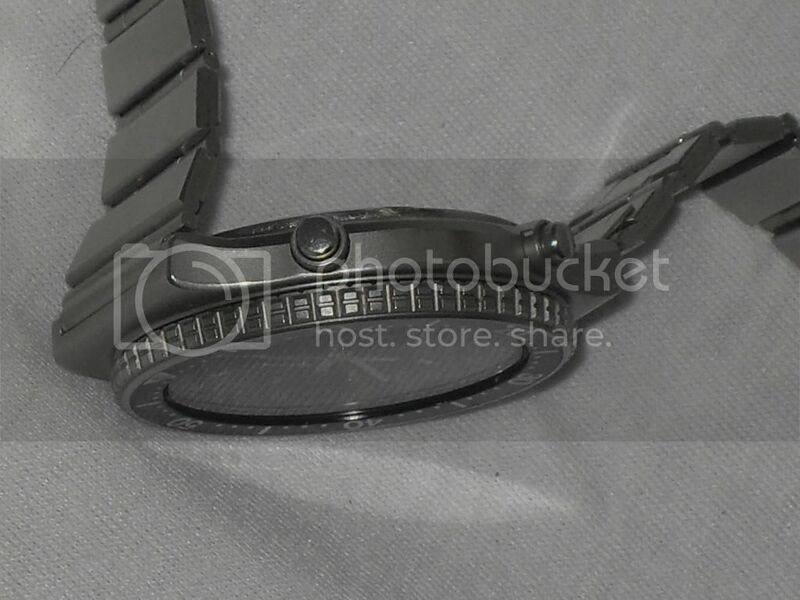 Is it my poor eyesight, or does the movement/dial need tweaking slightly to align correctly with the inner tachy ring? Thank you very much gentlemen and I believe you may be right about the bug but hopefully only a mild case. No 7ARCool nothing wrong with your eyesight. Party pooper! Christopher. If you look carefully at the lower edge of the Tachymeter ring you'll see there are notches moulded into the underside of it, which are supposed to align with (and clear) the the ends of the lumed dial batons. You can see shadows of them in your head-on photo, particularly between '400' and '160' where they're halfway across the batons. 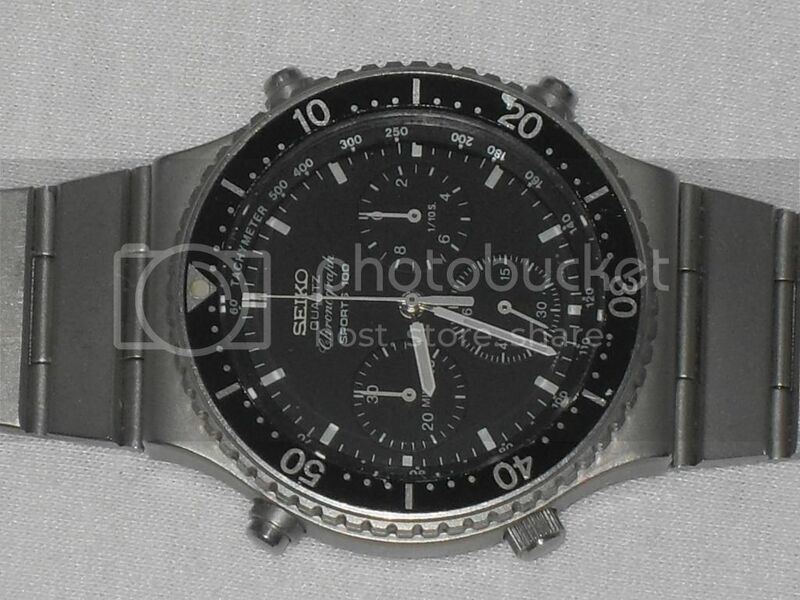 Your watch's Tachymeter ring needs re-aligning slightly (not the dial / movement). Sorry Kristo, I was just pointing it out as the Tachy ring is quite flimsy and could deform, also the misalignment could damage the lume pips/markers on the dial if not seated correctly. This is a simple fix and you should have no problem doing this yourself if you are careful. Christopher. Chris (7ARCool) is right - you need to get this minor issue sorted. Though I don't believe it's likely to cause any more damage to the lumed batons than it already may have done. 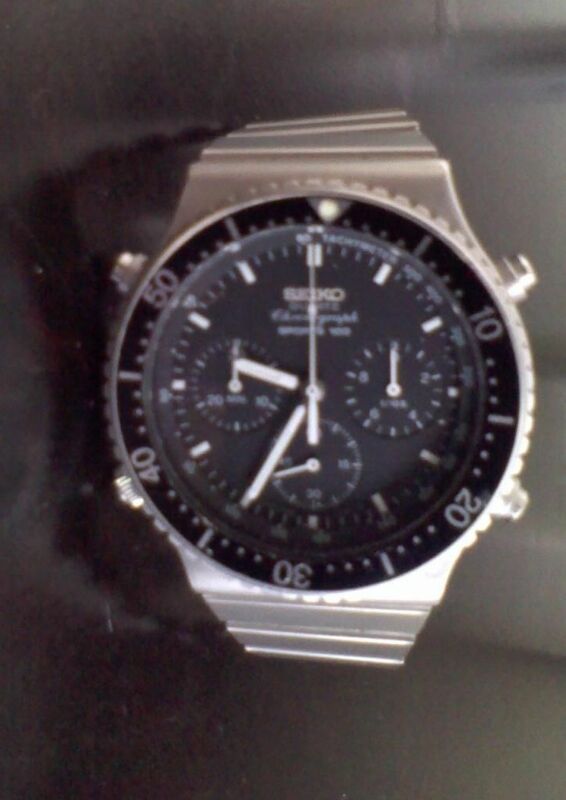 If you look at the seller's 'fuzzy photos' (and they were all much of a similar quality, regarding clarity, the misalignment of the Tachymeter ring was there for all to see. Perhaps it was the misaligned rotating bezel which drew the eye away from it. The '60' on the Tachymeter scale (and the small dot below it) should be aligned with the centre of the 12 o'clock double baton. The fact that yours is misaligned isn't necessarily an indication that the crystal in your watch has been replaced at some point. The Tachymeter ring in a 7A28-7040 / -7049 sits loosely on top of a small machined flange inside the watch case. The inner / lower (plain white unpainted plastic) part of it protrudes below that. The moulded pips engage cut-outs around the perimeter of the dial and should ensure correct aligment. A thin black painted metal dial ring sits on top of the Tachymeter ring. That is held in place by the crystal gasket (and the crystal). 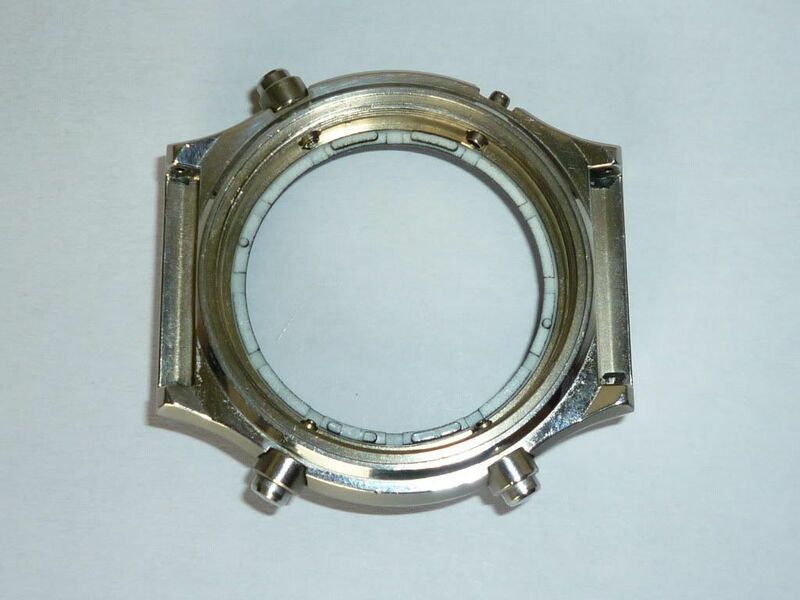 However the machining tolerances inside the watch case still allow the Tachymeter ring to 'float' and rotate freely. If you want to see more photos of some of the case components, check out this thread (my 8th post, halfway down page). 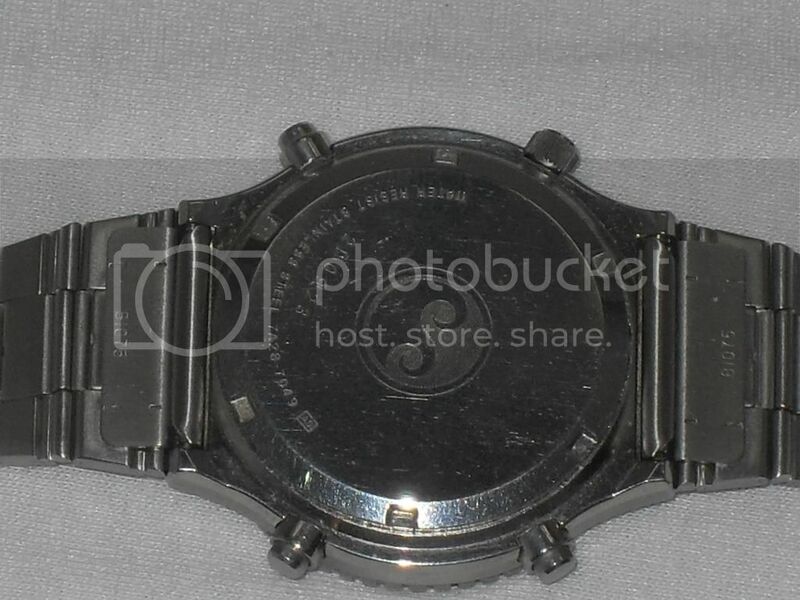 What your Tachymeter misalignment issue does indicate, is that at some point, someone has plopped the dial / movement out of the watch case - for whatever reason. 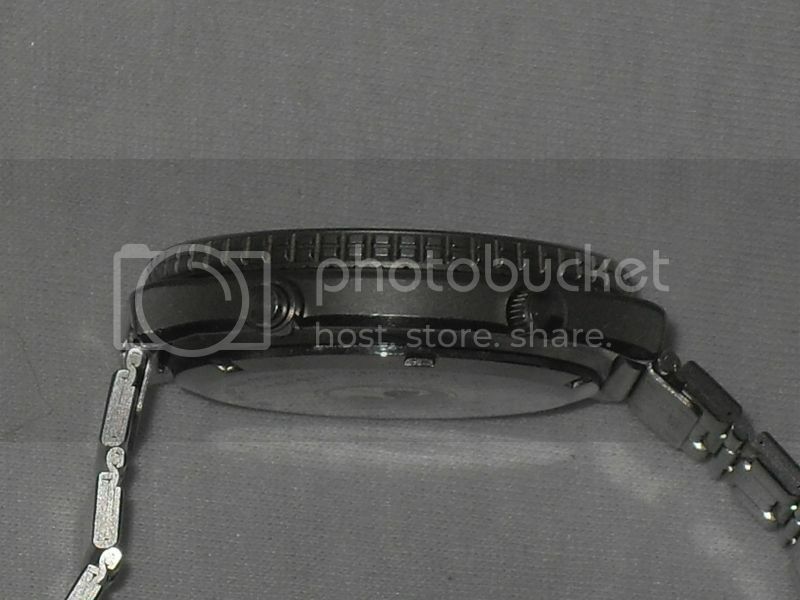 While it was out, or during replacment of the dial / movement they disturbed the Tachymeter ring. Easily done (if you're not careful) - and as Chris correctly states - very easily rectified. I can see that there will be no running away from this and as I mentioned I too find it somewhat irksome now it’s been so kindly pointed out so one way or another I shall have to rectify it. Also it never rains but pours it would seem. Whilst having a bash at trying to understand all the Chrono functions with the instruction manual I noticed that the Chrono minute counter wasn’t moving whilst the Chrono second and 1/10 second were doing what they do best when activated at the 2 o'clock start pusher, namely go round and round. When I push the stop pusher at 2 o'clock both Chrono second and 1/10 second stop as they should. When I push the reset to zero pusher at 5 o'clock both the second and 1/10 second reset to 12 o'clock. However it’s at this point that the minute Chrono counter sometimes springs into life and does a little sprint toward 12 o'clock, stopping usually around the 40 -45 min marker, in any case not always at the same spot and never reaching 12 o'clock.So far so clear? Now, when I pull the crown out to the first click I am able to reset all THREE Chrono counters manually by pushing their appropriate pushers. So it would seem that there is definitely power getting to the Chrono minute motor and when it is moving it is moving fluidly. I can almost hear the groans and mumblings: here’s another that’s got no understanding how to operate a simple chronograph. And they would be right. News to me but old hat to others here I am sure. All of the above leads me to this. Tomorrow I am crossing the pond to Old Blighty and my little treasure is coming with me and there it will remain for a good while. Now (you could see this coming I’m sure) if there is someone out there that feels ready and ABLE to have a go to rectify these little problems and maybe a lube job and change of oil filter etc. at the same time please PM me. All dealings of course carried out in the utmost privacy. An overwhelming disinterest toward this invitation to tender will not be taken in offence but simply as a sign that you lot are less crazy then it sometimes would appear. Guvnor, I am sure that you will splice dice and otherwise dissect this little banter and replace the pieces in their respective places if you think necessary and I will learn from that. Thanks so much to all for your interest, now I really must pack! Posts: 11 Great story, Kristo. You took a "leap of faith" and with a stroke of luck, you benefitted highly. I, too just got one of those, but the pictures were clear ....  and I knew the seller from another forum. As soon as I received it, I took it to a local watchmaker for a new battery and a pressure test. It failed the pressure test, so they changed the gaskets (chronograph pushers, case back and crown, and it pressure tested out to 10 bar. Can't complain. Enjoy yours, as I am enjoying mine.